In a surprise upset at the College of Engineering and Engineering Technology’s fall Senior Design Day, the structural harness for enhanced load lifting – or SHELL – project was awarded the Engineering and Technology Alumni Society Engineering Excellence Award, despite coming in second in the mechanical engineering department division. “That was a big surprise, but we’re really happy about it,” team member Andrew Meyer of Yorkville, Ill. said. 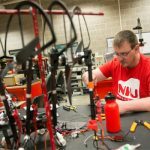 Taking top honors at the NIU College of Engineering and Engineering Technology Senior Design Day was an “Iron Man-inspired” arm. The team included (from left) Dalsen Ferbert, Ivan Rivera, Andrew Meyer, Katherine Chwistek and Adebayo Adejinle. Senior Design Day was held the Friday before finals. 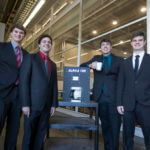 Thirty-seven student teams presented projects spanning the college’s four departments. The teams of seniors spent the academic year working on these capstone projects to demonstrate what they have learned in their NIU careers. The SHELL is a robotic sleeve attached to a back harness, designed to help the wearer with heavy or repetitive lifting. In their presentation, the SHELL team – including Meyer, Dalsen Ferbert of Lake Forest, Katherine Chwistek of Streamwood, Adebayo Adejinle of Naperville and Ivan Rivera – told judges 31 percent of nonfatal workplace injuries are musculoskeletal, and workers compensation claims for these injuries cost $15 billion to $20 billion per year. Credit for the team’s inspiration, however, goes to Marvel Comics. 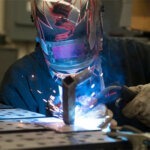 The team began the project last spring. 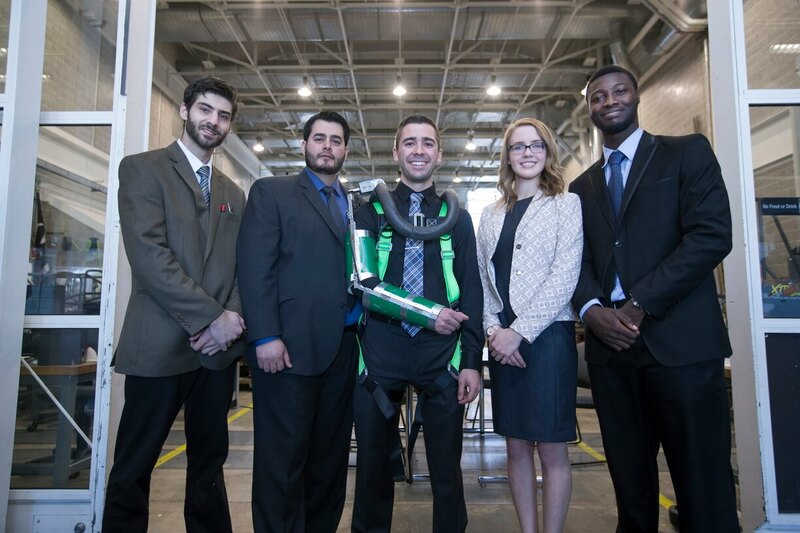 When Dean Donald Peterson joined the college faculty in July, they found just the mentor they needed – Peterson is an internationally-known expert in “exosuits” and “exoskeletons”, and he and his research assistant Simon Kudernatsch provided the team plenty of direction. In the mechanical engineering division, SHELL lost to a tie between the Alpha Cup coffee maker project and the Community Gardens Automated Irrigation project. Winning projects in the other divisions were the Analysis of the FMU1/HMU Mixed Model Assembly Line at Woodward in industrial and systems engineering; RePaCo IoT Chiller in electrical engineering; and Human Centric Wearable Sensor Array in engineering technology.